There will be no U-turn on the decision for Samcro to spend this season over hurdles despite proving no match for Buveur D'Air when second in Saturday's Fighting Fifth Hurdle at Newcastle, according to trainer Gordon Elliott. There was a swell of support for Samcro (6/5 favourite) before the off but last year's Neptune winner was blown away by Nicky Henderson's Buveur D'Air (11/8), which eventually came home eight lengths to the good after a stunning display. Elliott insists that they won't throw in the towel yet though and the 2019 Champion Hurdle is still the principal aim for Gigginstown's precocious six-year-old. "The plan was always to keep him hurdling, we'll go to the Christmas Hurdle at Leopardstown, the Irish Champion Hurdle and then back to Cheltenham for the Champion Hurdle and take on Buveur D'Air. 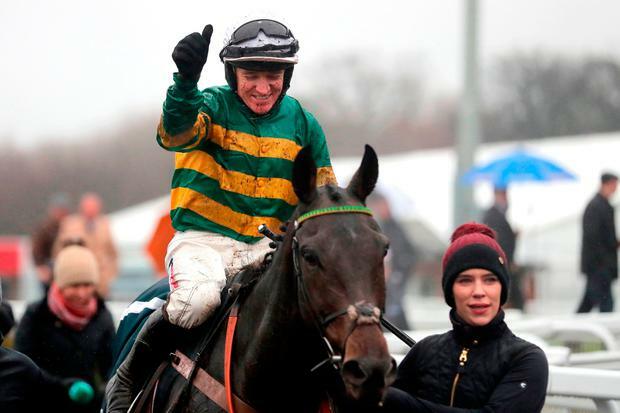 We're not going to hand him the Champion Hurdle," Elliott said. Henderson waxed lyrical about his back-to-back Champion Hurdle winner - which stretched his unbeaten run to 11 races and over two-and-a-half years - after "an incredible performance". "There is so much more improvement in him," the Seven Barrows trainer said of his seven-year-old. "Last year's Fighting Fifth was a penalty kick but they went a proper gallop here and were trying to stretch his fitness. "I thought it was very smooth and slick. He looked like a true champion. Some people haven't rated him as a dual Champion Hurdle winner, he wasn't at his best in this year's race but I don't think he was right at the time. "It's great to see him come back and do that. I can't see why he won't do the Christmas Hurdle, somewhere and you know where in March - the dream is still alive." With Willie Mullins' Kemboy encountering travel problems, there was no Irish representation in the prestigious Grade Three Ladbrokes Trophy at Newbury on Saturday where Colin Tizzard's Sizing Tennessee (12/1) turned a usually competitive handicap into a procession. Tom Scudamore was always confident on Tizzard's ten-year-old and he flew home after the last to score a facile success over stablemate Elegant Escape by ten lengths for his emotional jockey. "I lost my grandfather two weeks ago, it was his funeral yesterday and I wasn't able to go - those are the sacrifices you make. I was so sorry not to be there, but he was with us today," Scudamore said. Meanwhile, Rachael Blackmore strode to the head of the Irish jockeys' championship as Mortal (10/1) took the beginners' chase at Fairyhouse on Saturday to kick-start a 714/1 four-timer for Joseph O'Brien at the Meath track. Lone Wolf (9/4), Jack Dillinger (4/1) and Desir Du Large (3/1) also scored for O'Brien as Blackmore (61) edged ahead of both Paul Townend (60) and reigning champion jockey Davy Russell (59). Elsewhere, Aidan O'Brien's Mendelssohn (17/10 favourite) was out of luck in the Cigar Mile Handicap at Aqueduct on Saturday night when Ryan Moore's mount was fourth behind Chad Brown's Patternrecognition (54/10).